This light green serpentine mala necklace combines dark green jade, moss agate, and gold vermeil bead caps. 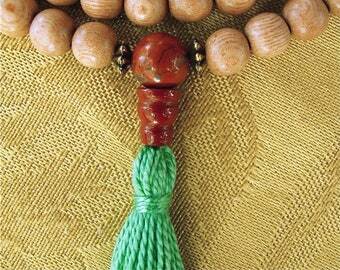 Finished with a three-holed serpentine guru bead set and dark green cotton tassel tied with a gold thread. Whether you wear it or use it in meditation, it invokes peace. Reputedly, serpentine helps raise kundalini energy for transformation. Moss agate brings stability, persistence, and grounding. People tell me that serpentine makes the most gentle-feeling, tranquil malas. There are 111 beads total. That's the traditional 108 plus three extra to make up for mantras you may have said distractedly, Tibetan style. 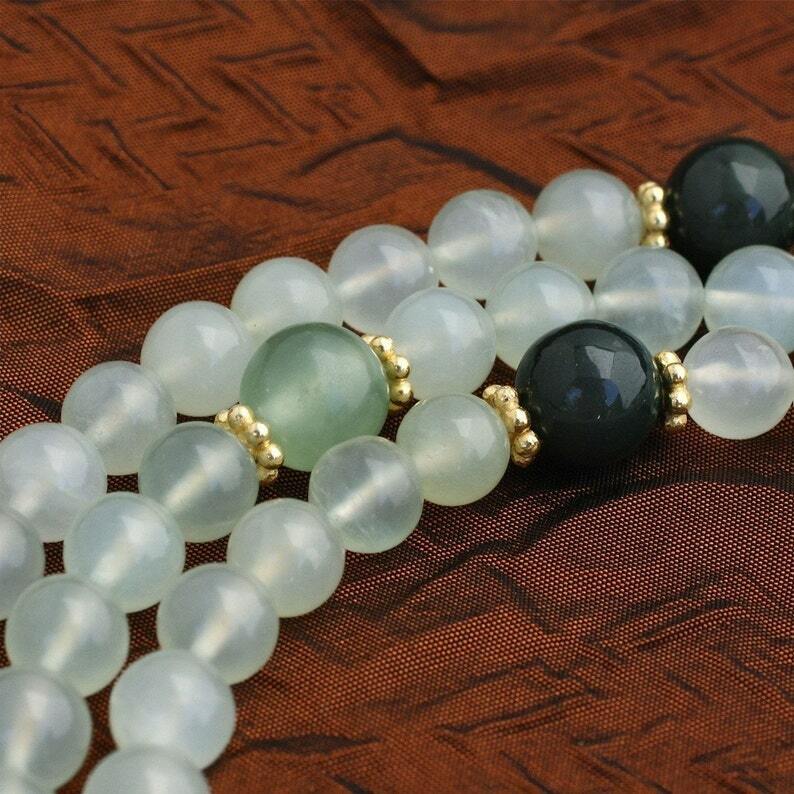 Made of 8mm serpentine beads with moss agate and bloodstone market beads, surrounded with good vermeil findings. All are strung with love on softly coiling nylon-coated beading wire and finished with a tassel I made of forest green cotton. A small wrap of gold thread finishes the tassel. The marker beads sit at 7 and 21 on both sides and 56 at the top.